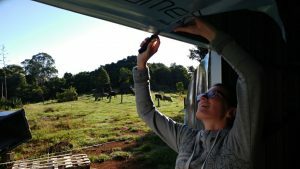 We have finally installed all the windows in our tiny house on wheels!! I’m so excited about this. With the glazing in place, we’ve officially reached another milestone in our tiny house build. This is even more exciting because we built the windows ourselves. Can you believe it? We must be the only tiny house builders out there who’ve done that. No one is that crazy. Why did we build our own windows? The answer to this is simple. We wanted them to be light-weight but yet double glazed/energy efficient and affordable. We looked at a lot of options. From custom-made since double-glazed is not standard here in OZ to second-hand. But none of them was feasible. And buying single glazed windows is not an option at all because they’re terrible when it comes to energy efficiency. And yes, double glazed windows also make sense here in Australia!! So in the end, we decided to build the windows ourselves. It was a steep learning curve with lots of trial and error but the windows look awesome. I’m very proud of our achievements. Would I build my own windows again? Probably not. The amount of work and precision that goes into the whole process is insane and time-consuming. But we also learned a lot about woodwork and different joining techniques. So it was definitely worth it. 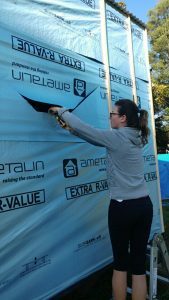 So now that we have the finished product, I will show you how to install windows in a tiny home. This process is very similar to installing our entrance door (which we also built ourselves, by the way). The first thing you will have to do is cut open the building wrap. Start at one of the top corners and go towards the centre at a 45° angle. This doesn’t have to be accurate. Stop when you hit the centre. Repeat this step for the remaining three corners. Now you have to fold over the building wrap around the steel beams. To hold the paper in place use double-sided tape or spray glue. When fixed to the steel beam, cut off the excess building wrap. Repeat this for the sides and the top and bottom of the frame. In order to prevent water from dripping into the house, you have to tape the top corners of the steel frame. Water should not be able to get through the window frame or sachets in the first place because flashing, exterior cladding and guttering should prevent this. This step is just an additional precaution. Cut off another smaller piece of tape, about 6 cm, and stick it over the corner you just did. The tape should overlap the corner by about 1 cm. This is to make sure water just runs off instead of into the house. Have a look a the photos for a more visual explanation. Repeat this process for both top corners. Step 3: Tape the bottom corners of the steel frame. Now you have to do the bottom of the steel frame. For this, we need another strip of weatherproof tape. The strip has to cover the full length of the steel frame plus an overlap of about 10 cm on each side. Stick the tape to the frame and make sure it also covers the inner beam of the steel frame. Make a cut at each end of tape where it hits the corners and fold it over. Make sure the corners are fully taped. Perhaps use additional strips of tape to cover them properly. Step 4: Bolt on the window frame to the steel frame. Once the tape is in place, carefully insert the window frame into the gap. There should be small gaps on either side of the frame and on the top. 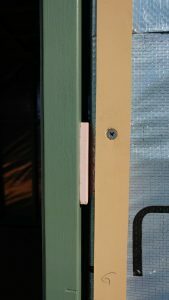 You will need those gaps to shim the window into its final position making sure it is 90°. You have to allow for those gaps when buying or building your windows. Before you bolt on the window frame, make sure that the window sachets are closing properly without scratching the window frame. Adjust if necessary and use small wooden pegs to shim the frame in place. Once the window frame is in place, bolt it onto the steel frame where the wooden pegs are. That’s it! Now repeat this for all your windows and you’re done! Window installation is pretty straightforward and shouldn’t take you long at all. I am confused. Did you build the window frame with glass and then install it? Where did you buy the window frame from? Did you build the window by welding or screws? I noticed the windows are gas lift windows. Thanks for your comment. We actually built the windows and french door ourselves. We wanted them to be light-weight but also thermally efficient, so we used pine wood for the frames and sachets and acrylic instead of glass. Acrylic has better thermal properties than glass/double-glazing (apart from being much lighter of course). And we had to learn proper mortise and tenon joinery for the wooden frames. Finally, we decided to use gas struts because we wanted to be able to open the windows all the way for maximum airflow. Hi I am trying to look up the material you used to make the windows and I am having difficulty finding sachets. 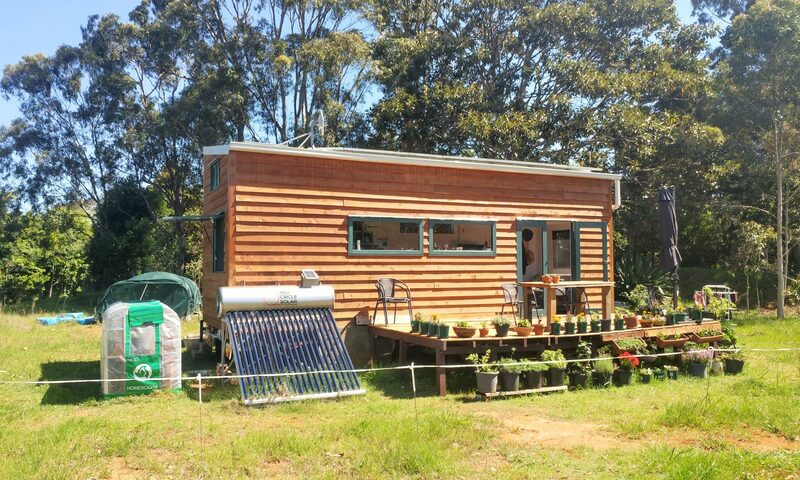 We watched a lot of YouTube and built our french doors and windows ourselves from light-weight pine wood. Alternatively, you can find sachets 2nd hand online or in scrap yards. Good luck. Previous PostPrevious We’re installing our brand new and homemade entrance door! Next PostNext The cedar siding for our tiny house on wheels is going up!